The work of Dutch master flower painter, this floral tapestry "Bouquet Exotique with Monkey" shows a scene of flowers in an exotic setting including a monkey, by Jan Frans van Dael (1764-1840). In the 18th to 19th century the most prestigious annual art event was the 'Academie des Beaux-Arts' in Paris. Van Dael won the gold medal at this event and gained recognition as one of the most talented flower painters of the time. Here we see a floral arrangement in an exotic scene of a parrot and monkey on a background of ruins and palm trees. The inclusion of these Oriental elements reflects the increasing fascination by European artists with Oriental culture due to travels and bringing back of exotic flora and fauna by explorers. In this work, we see a gorgeous balance in the composition as well as color, a signature of the works of van Dael. 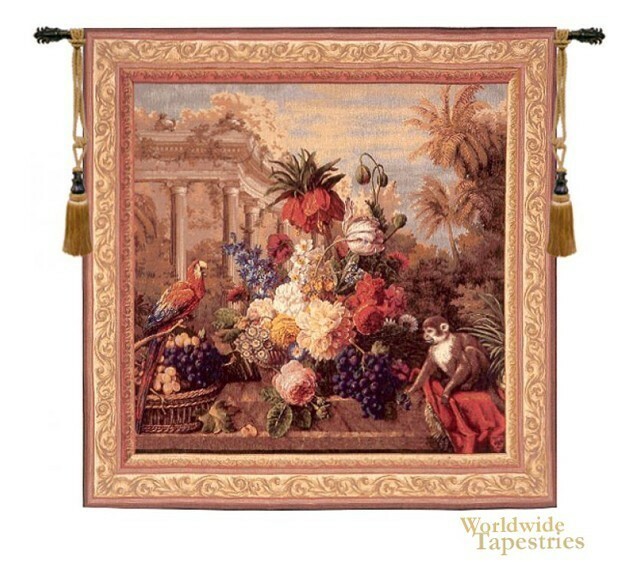 This floral tapestry "Bouquet Exotique with Monkey" is backed with a lining and has a tunnel for easy hanging. Note: tapestry rod and tassels, where pictured, are purchased separately.